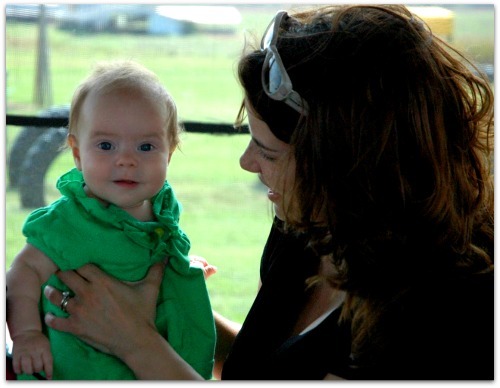 Mommy and Me: The Dairy Farm - The Kennedy Adventures! Recently, we took a trip to Cheney’s Dairy Farm (because my sweet friend Erin is a better planner than myself!) I’m a slacker, and haven’t done a wrap up yet, but I wanted to share this beauty with you …..
Hand the camera to your husband, so you and your children will have pictures with YOU in them when they grow older! Don’t worry about your hair, or your post partum belly pudge. You’ll look back in 20 years and cherish these pictures. Head over to Krystyn’s spot to share your Mommy and Me pictures. I am AWFUL about passing the camera, and I DO regret it now! (and mine are only 11!) BUT, for those with bigger kids who can huddle around a web-cammed computer? Time ’em and take ’em! Thank you for the reminder and for the lovely image as inspiration! This is a sweet picture! Love simple moments like this!